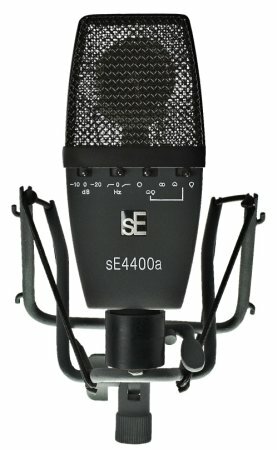 The 4400a is the latest in a lineage of mics started 6 years ago with our sE2200a. Based on the same capsule tuning, but with a dual capsule to give multi polar pattern function, this mic is a rarity… a true all-rounder. It has 4 polar patterns, Cardioid, Hypercardioid, Figure of 8 and Omni. 2 bass cuts at 60Hz and 120Hz; 2 pads at 10 and 20dB. The chassis is small… very small, but still manages to house a twin diaphragm 1” capsule and all the top grade electronics and switches. This flat, round edged chassis design allow the mic to be used flat onto a drumhead or guitar cab, or pushed through into the skin of a kick drum. It is also perfect for sung vocals and voice over work, because although it’s the smallest mic of it’s type, it still ‘looks’ big when used full face on. It is extremely thin at less than 3/4” and fits neatly in the palm of your hand. sE4400a has a unique, black, non-reflective, non-marking, rubberised finish which is ideal for live stage, theatre, TV and broadcast applications which require lighting. Finally, the capsule has been specially tuned after almost 2 years of pre-market tests with professional studios and broadcasters, to really be something that very few mics can; the true all-rounder. Vital in professional studio or broadcast applications where an engineer needs to know he can reach for a mic that will handle any job, and equally for the home studio user who is on a budget and needs one mic to suit every occasion. The mic is multi-functional yet uncluttered, the sound is smooth and flattering and yet, because the capsules are hand made (like all sE mics) and then individually tuned, it benefits from lacking the usual hyped top end of most modern mass produced mics from automated machines. It comes with a unique shock mount which allows you to fit the mounted mic into tiny spaces, or invert the shock clamp to extend the mic fully outside the shock mount for close mic-ing applications or vocals. It also comes with a full, steel re-enforced, black aluminium, signature sE flight case. Available also as a stereo pair, hand-matched at the factory, this mic is set to be a classic.